Seasonal Occurrence: Uncommon throughout the year. 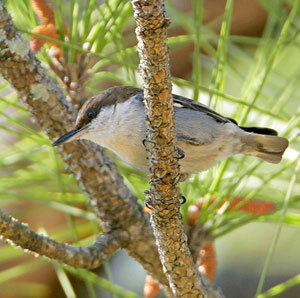 Notes: The Brown-headed Nuthatch is resident in southeastern pine forests. East Texas is on the western edge of its range. It is more often heard than seen as it prefers to forage high in the tree tops. It is seldom found within Houston's city limits, partly because of the difficulty in spotting it. The best way to find one is to learn to identify the song, a squeaky ki-dee. Unlike other nuthatches Brown-headed Nuthatches are more likely seen among branches and pinecones than on tree trunks. Males and females look alike. Kleb Woods Nature Preserve in Tomball is one of the best locations to look for them, and sometimes one can be found in Bear Creek Park in west Houston.